Detailed summaries of the player character races native to Golarion, including more than a dozen distinct human ethnicities. Elaborate gazetteers of more than 40 crumbling empires, expansionist kingdoms,independent city-states, and monster-haunted wildlands of Golarion's adventure-filled Inner Sea region, with locations perfect for nearly any type of fantasy campaign. 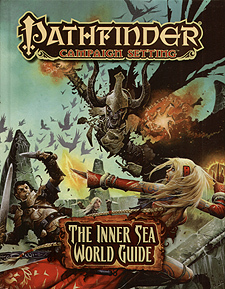 Cultural information and Pathfinder RPG rules covering the 20 core deities of the Inner Sea, plus entries on other gods, demigods, forgotten deities, weird cults, strange philosophies, and more. An overview of the Inner Sea's history, a look at time and space, a discussion of magical artifacts and technological wonders, discussions of important factions and organizations, and hundreds of locations ripe for adventure! Tons of new options for player characters, including Inner Sea-themed prestige classes, feats, spells, adventuring gear, and magic items! Nine new monsters, including exotic humanoids of the skies and seas, undead and dragons, and an angry demon lord in exile! A giant poster map that reveals the sweeping landscape of the Inner Sea in all its treacherous glory!